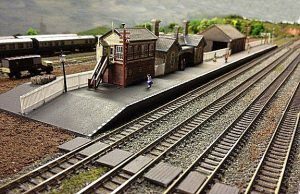 Milverton was a station on the Taunton to Barnstaple line that ran between the Quantock and Mendip hills just south of Exmoor. The line was closed in the 60’s with the last train running through Milverton in 1964. None of the station survives and part of the track bed has become the bypass to Wiverliscombe. In fact the only sign of a railway is the bridge that carries local traffic into the village and the house by the bridge called Station Masters cottage. The layout was built to give a flavour of the original not an exact copy. The Station layout is the same, with four tracks instead of two and with added coach sidings and a small one track branch line to enhance the preserved line feel. 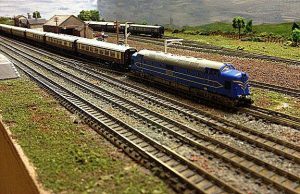 This allows me to run what stock I like and makes use of my many loco’s, coaches and wagons. 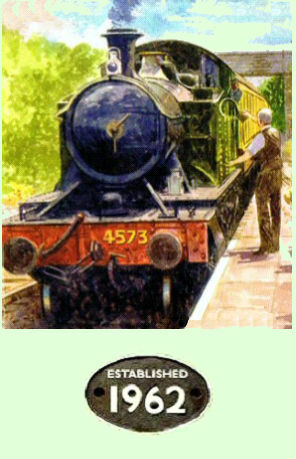 The two centre boards show the Station as I think it may have looked if the line had stayed open as part of the “Mid West Somerset Railway” and had been used as the preserved line instead of the actual Taunton to Minehead “West Somerset Railway” located north of Exmoor. The two lines split at Norton Fitzwarren. 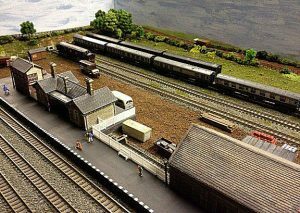 These two boards were made as part of the Berkshire N Gauge Society’s layout, which is a modular layout using the NMod regulations, with each member contributing boards 4’x2 in size. 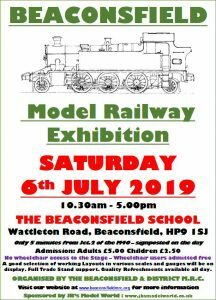 The corner boards and the four track cassette, fiddle yard were added to enable me to use the boards at home, or exhibitions, without the need for the whole BAG layout being present. 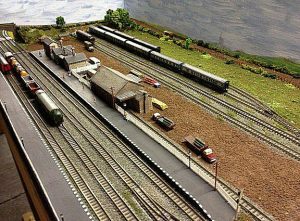 I have other scenic boards that replace Milverton that changes the layout to another location – Langley Shed and Dewrlish.